I picked up 1992’s Jaran in 1992 and what with one thing and another only just now got around to finishing this anthropological romance (as mandated by this very commissioned review). 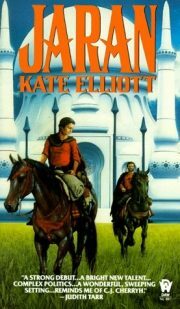 I have read the Crossroads series so I am not unfamiliar with Elliott’s fiction; it’s just this one I didn’t read at the time. Why? It tickled a peculiar and no doubt shameful prejudice of mine, of which more later0.